Choosing the right music for your video is no easy task, here’s how. Choosing the right music for a video is not an exact science but rather an art. Next, we will give you several tips so that you can optimize this process and not only to have a good result but to waste the least amount of time. Choose the song before creating the video! This guide will cover both music for corporate videos as well as homemade videos. Should music support the message as background music or should it have a leading role? To do this, look at whether you are trying to convey technical and accurate information (such as the details of something) or, on the contrary, it is broad and more generalized information in which the viewer does not have to be so aware of the specific details, but the emotionality of the video itself, in which the message is already given by the same images. If you want to transmit detailed information, choose a background song without many changes and that doesn’t catch the attention of the viewer. It will be a support song. If on the contrary, you transmit broad and little-detailed concepts, look for a type of music to put in the foreground that evokes more emotions. Without fear! Another essential point to keep in mind is if the song will have incorporated vocals (someone singing) or not. It is best to choose songs without lyrics for the first type of video that we have seen, since they do not take protagonism over the main voice. If, on the other side, the music is going to have a leadership role then yes, we will then be able to choose vocal songs. Our best option, since these are songs specially designed to be placed as background music in videos and their licenses of use will fit perfectly our purpose. The largest Internet marketplace to buy this type of songs is called Envato Elements. There you can find all kinds of music with different genres and instruments and sound effects under a $16.50 monthly subscription. The good thing about this website is that it will allow you to download unlimited songs and cancel the subscription at any time. This way you will be able to try all the songs you need in your video and use only those that work. Another very valid option is to use a service like Epidemic Sound. For as cheap as 13€/month you can use all their royalty-free library (300.000 songs) and fully monetize your videos, so you will never receive a copyright claim from YouTube again. And they have a 30-day free trial as well. 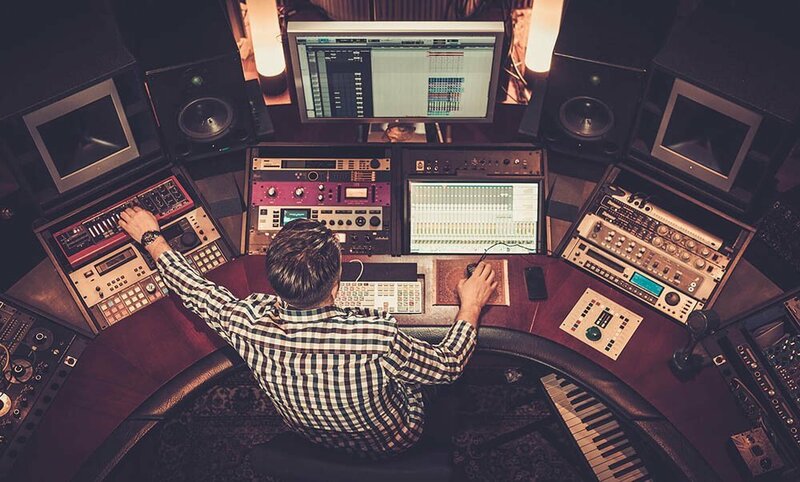 We do not recommend them since it will be more complicated to find the high quality that we are looking for and each of the licenses has different specifications that will make the insertion of music in our project more or less complicated. There are six different types of Creative Commons licenses and many of them do not allow the use of music in commercial projects. For more information about them, visit this article in which we explain what royalty-free music is. Consider hiring a composer only if you have the right budget and the video is really important. A composer can convey the moods and concepts that will be developed in the video to perfection. If you want to create a series of videos, it is also a great option so all of them have a musical cohesion and helps to transmit a strong musical brand. 3. Align the music with your audience. Who’s going to be watching the video you or your company are creating? Is it aimed at children, young people, managers of large companies, university students…? Use a musical genre that fits your audience and doesn’t break with the schemes of your own video. That is, if our video is aimed at moms with kids, we will certainly not choose the rock or hip-hop genres for it. It’s common sense. As well as we will not put classical or country music if we address young twentysomethings, but we will probably choose some type of royalty-free electronic music. Ambient: perfect for a young audience, in their twenties. Corporate: perfect for video and business communications. Classic: for videos aimed at older people. Country: ideal for a male audience and in the forties. Drum & Bass: for videos aimed at a teen audience. Epic: perfect for sports videos. Electronic: for videos aimed at a young audience. House: for videos aimed at twenty-somethings. Children’s: for videos aimed at children or their mothers. Folk: ideal for an audience between the twenties and the thirties. Funk, Groove: ideal for a young audience. Soul, R&B: ideal for a female audience and in the forties. Hip-Hop: for videos aimed at a male and adolescent audience. Jazz: ideal for an audience between the thirties and sixties. Pop: for practically all types of audiences, especially young people. Rock: perfect for a male audience and thirties. Experimental: it’s hard to find a model audience. There are more cheerful and positive tones, others calmer and even others that lead to sadness or empathy. Looking at our video, we should not only choose the main tone well but also take into account the changes in tone during the song. For example, many songs begin with sad or sober tones. As the song goes on, the composer raises the pitch so that the song becomes happier as the “story” improves. The opposite is done too when we want to go from a positive situation to a negative one. Therefore, keep in mind when choosing the song the tone of it. Listen to it from beginning to end by focusing only on this aspect and you will discover how to place it in the video. It is much easier to adapt a video to a song than the other way around. And this usually happens because of the reason we mentioned in the previous point: the rhythm and tone of the music are the ones that carry the baton as far as the movement of our emotions is concerned. And our emotions are what really matters. Therefore everything else must be subjugated to it. So from now on, remember this golden rule: choose a song first and then create the video above it. Both the image and the audio must be united in a perfect relationship so that they do not appear uncoordinated. At this point only the practice counts, so the more videos you edit and the more you notice how others do it, the better results you will get. One of the essential aspects of this point is the way music “enters” the beginning of the video and the way it “comes out” when it ends. Consider giving it a prominent aspect in both sections, as this will help set the tone, give a coherence to the message and leave the viewers with a sense of fullness. Visit our article about music for Youtube for more information!